How do I Install Molding Around Pipes & Cut Out Plates? Molding covers gaps along the edges of material such as flooring or drywall. Typically the lines along floors and ceilings are fairly unobstructed but knowing what to do when faced with an obstruction can prevent panic. Take a common sense approach and make the minimum adjustment to incorporate the obstacle into your moldings. Choose a spade or paddle bit the same width as the thickness of your pipe for a clean fit. Measure the position of the pipe and mark it on the molding, measuring from the next nearest joint, or the end of the wall. Mark the center of the pipe at the proper position in line and at the right height. Measure the pipe's thickness. Use a framing square to transfer the center mark up to the top edge of the molding and mark it. Install a paddle bit into your drill the same thickness as the pipe. Bore a hole, making sure to center the bit on the mark you made for the center of the pipe. 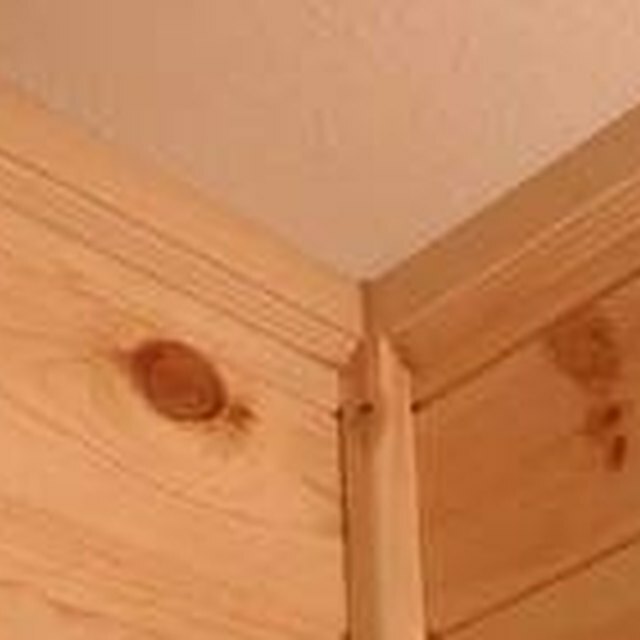 Place the molding on the table of your miter saw with its top edge up and the back of the molding against the fence. Set the saw to 45 degrees and cut from top to bottom on a 45-degree angle through the center of the hole. Install the molding in two pieces, one on each side of the pipe, so that the mitered cut is centered on the pipe. Fit the miter snugly together to make the smallest seam possible. Nail the molding in place with a finish nail every 12 inches. Fill the seam with wood putty and allow it to dry; sand the filler smooth with a piece of emery cloth. Shim light switches, plug-ins and other control plates out from the wall by the thickness of the molding. Turn off the breaker that controls the connection you are working on. Remove the screws from the face plate of the electrical junction and remove the plate. Remove the screws at the top and bottom of the switch or plug (component) at the top and bottom of the junction box. Pull the component out, extending the wires. Fit electrical plate cover shims (available at most hardware stores in all common sizes) around the component to space it out from the junction box the desired amount. It is best to space it out just past the thickness of the molding. Replace the screws at the top and bottom of the component with screws long enough to fit through the shims and the plate. Choose screws the same thickness and thread type as the original screws. Reinstall the electrical component and replace the plate. Tighten the screws with a screwdriver. Measure from the nearest joint or end of the wall to the edge of the electrical box shim. Mark the position of the box on the molding. Mark the height of the bottom of the shim on the molding as well as the far side of the shim. Cut out the marked area with a jig saw. Fit the molding in place, with the cut out snugly around the edges of the electrical box extension shim. Caulk any gap between the molding and shim. The edge of the plate will cover the cut. A block of wood of the proper thickness can be substituted for the junction box extenders. Cut out the inside to fit the box and run the molding up to the flat edge of the piece on the outside.